Commercial hot waxes applied by automatic car washes have been known to make the windshield difficult to clean. 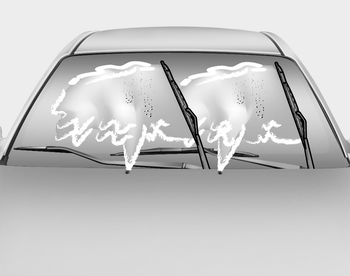 Contamination of either the windshield or the wiper blades with foreign matter can reduce the effectiveness of the windshield wipers. Common sources of contamination are insects, tree sap, and hot wax treatments used by some commercial car washes. If the blades are not wiping properly, clean both the window and the blades with a good cleaner or mild detergent, and rinse thoroughly with clean water.